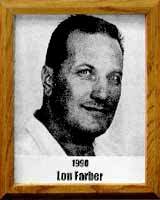 Lou Farber spent 50 years as a coach, first in Rhode Island, then in Tucson as the first head coach at Pueblo High School when it opened in 1956. Nationally known as an innovator, he was a consultant for programs on all levels. Farber was an All-American pulling guard for the famed 1926 Brown “Iron Men” who captured the imagination of football fans throughout the United States. His Pueblo teams, with possibly lesser talent than some other schools, won state titles in 1958 and 1961, and his 1967 team was second in Arizona. He had only one losing season at Pueblo.